Unlike the Modi government, coalition cabinets from 1977 to 2014 have been based on a quota system in which no prime minister has had the privilege of choice, perhaps not even within his own party. A notable feature of what could be the penultimate cabinet reshuffle of Prime Minister Narendra Modi’s National Democratic Alliance (NDA) cabinet is that it was limited to BJP ministers alone. The NDA allies, at least those present at the swearing in ceremony, were onlookers. Even Nitish Kumar’s Janata Dal (United) – which has helped expand the NDA rule to yet another state – was conspicuous by its absence. Nitish was reportedly irritated at not being invited to the ceremony and reportedly his party was not asked to join the government. The Shiv Sena, the BJP’s partner in Maharashtra, also complained of being ignored. It is difficult to believe that while the prime minister thought only the saffron pack needed to be shuffled, other hues in the coalition were perfect and shining. Or that the allies did not want to change either their nominees in the government or their portfolios. If true, this would reflect that the compulsions of coalition politics operate on a strong prime minister too. To analyse the current NDA government’s political trajectory, it is essential to look at coalition cabinets of the past. The interim cabinet of 1946 was to be a coalition, but a Muslim League unbending on Pakistan did not join first, then came in as a coalition partner only to wreck the coalition deliberately till the governments of the two dominions separated. The Congress and Jawaharlal Nehru, in whichever order we want to put them, conceived of the first post-independence cabinet as a national coalition. Though there was no compulsion in a Congress-dominated cabinet, B.R. Ambedkar, who was an ardent critic of Gandhi, Nehru and the Congress, Hindu mahasabha member Syama Prasad Mookerjee (the founder of the Bharatiya Jan Sangh), as well as eminent non-party public persons as representatives of different communities – Sardar Baldev Singh (Sikh), John Mathai (Christian) and C.H. Bhabha (Parsee) – were included. Indeed, since each was a prominent personality with a strong view of their national role, political homogeneity – an unwritten principle of cabinet government – was missing, and some of them resigned in a few years. Between then and now, the country has experienced coalition governments during 1977-79 (Janata Party was essentially a coalition), 1979-1980, 1989-90, 1990-91, 1996-97; 1997-98, 1998-99, 1999-2004, 2004-2009 and 2009-14. The 2014 coalition of the NDA is an interesting experience where the BJP has an absolute majority in the Lok Sabha. Each one of the coalition cabinets from 1977 to 2014 has been based on a quota system in which no prime minister has had the privilege of choice, not perhaps even within his own party. Not merely the nominees for the cabinet and the council of ministers, even the choice of portfolios was not a prime ministerial privilege, at least not entirely. In 1979-80, 1990-91 and 1996-98, outside supporter Congress was the spoiler. V.P. Singh had Tau Devi Lal towering above his shoulders, aside from the quotas specified in the ministry by satraps. Manmohan Singh, in his two-full-term stint, was stymied incredibly between the party president and the satraps in the coalition. In each of these cases, performance appraisal, cabinet reshuffle and distribution of the portfolios has not been a prime ministerial privilege. We would do well to recall the drama around the sacking of Raj Narain by Morarji Desai that led to the fall of his government in less than a year. In a series of interviews with this writer, former prime minister late I.K. Gujral said that since he had been selected to lead the beleaguered United Front government by Lalu Prasad Yadav, Chandrababu Naidu and others, he did not have the freedom to pick his council of ministers. He reappointed H.D. Deve Gowda’s council of ministers in entirety. Similarly, Manmohan had no freedom to sack any minister despite grave corruption charges during his tenure leading the UPA governments. The first NDA in 1998 was a combination of pre- and post-electoral alliances of 17 small and big state parties, some independents and the BJP. More cautious after the 1999 one-vote loss, the party was more thoughtful in putting together a firmer pre-election coalition. No wonder the coalition led by Atal Bihari Vajpayee lasted a full five years and had a smooth run as an alliance as compared to the Congress, which ran roughshod over its allies for a decade (2004-14) to find itself weaker at the end and is viewed with suspicion as domineering and self-seeking. The general election in 2014 did not kick off with a hope of a single party coming to power. While Manmohan quit the UPA leadership contest in favour of Rahul Gandhi, the BJP saw a coup of sorts as Narendra Modi threw his hat into the leadership ring, effortlessly displacing a self-assured Lal Krishna Advani. Up until Advani was expected to lead the NDA in the polls, the BJP (and the Congress) were hoping to win 180-200 seats in the Lok Sabha, leaving the post-election scene wide open. No wonder the BJP entered the 2014 election with 46 allies (17 registered parties) across the country (according to the BJP office, the NDA is now an alliance of 27 parties). The election results, however, astonished even the most optimistic political analysts when the party gained an absolute majority with 282 Lok Sabha seats. The NDA gave the BJP a further edge with 54 more seats, bringing the alliance total to 336. The party has since displayed a tremendous appetite to add allies. Its reputation as a better manager of the cadre and allies since 1998 has made it more worthy coalition partner than the Congress. Moreover, the lure of power and pelf have made its task easier. That it has emerged as the richest party since 2014 is an open secret and it has given a body blow to other parties’ cash management with demonetisation, keeping its chests secure. Interestingly, the political analysis today neither probes the new ayaram gayaram phenomenon, nor the pelf politics, which was probed in the 1970s as suitcase politics. 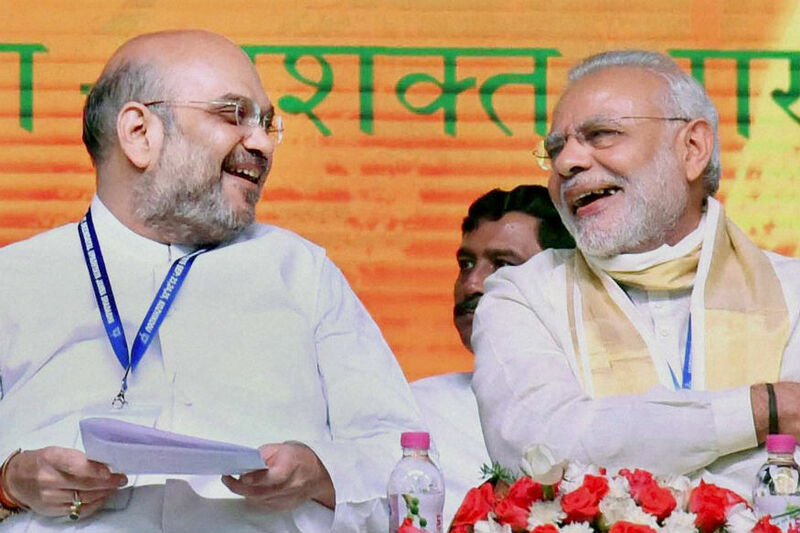 The retaining of the NDA alliance despite the BJP securing an absolute majority in the Lok Sabha was admittedly a master strategy by the party. It obviated the chances of the smaller parties getting into any other alliance as well as retaining the NDA strength. This has tremendously helped the party in electing the president, the vice president and members of the Rajya Sabha. However, a council of ministers dominated by the prime minister’s office and the Modi and Amit Shah duo does not allow any leeway to any minister or ally to push their agenda. The sleight of hand in expanding its reach across the country, not only to win but also to appropriate states, has given the Modi-Shah-led BJP a sense of invincibility. It also gradually appears to have shaped the party leadership’s attitude towards the BJP’s allies and the alliance. A sense of dominance was visible in the current cabinet reshuffle. Allies were virtually invisible. While Nitish has reasons to grumble, Naidu too was reportedly unhappy. It will be interesting to keep an eye on developments leading into the 2019 polls from the perspective of the NDA, the government and coalition politics.